On October 14, 1953, Pope Pius XII presided over the dedication of the new Pontifical North American College seminary on the Janiculum Hill above Saint Peter’s Basilica. Nearly one hundred years had passed since the seminary’s founding, and the Pope considered the new campus’ completion “a stronger flame of hope for the Church in the United States of America and in the world.” Devotion to the Holy Father, the grace of priestly ordination, and a solid training in the Church’s teachings were the three treasures that young men trained at the “NAC” brought back with them to the United States as priests. 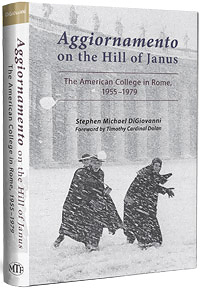 In this follow-up to Father Robert McNamara’s monumental work, The American College in Rome, 1855–1955, Monsignor Stephen M. DiGiovanni advances the history of the College over the next quarter century. The American students in the 1950s were not the same as those who had lived in the old seminary during the previous century. The world was very different after numerous revolutions, social upheavals, and two world wars. Other forces were at work as well, including some changes just beginning to take place in American society, which would become radically and publicly manifest on American university and seminary campuses during the next decades—even in Rome. If prior to the Second Vatican Council everything was clear and regimented, then during and after the Council less and less was clear-cut or well-defined on the “Hill of Janus.” In fact, few could have predicted the aggiornamento or “updating” that was on the horizon that would profoundly reshape, for better or worse, the NAC and its future priests.